Ngoepe has yet to arrive at Phillies camp while he waits to secure a travel visa, Meghan Montemurro of The Athletic reports. Ngoepe was already facing an uphill battle to win an Opening Day bench role with the Phillies by virtue of being a non-roster invitee, and the missed time to begin camp won't help his case. 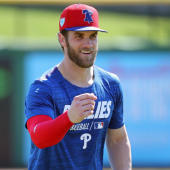 He'll likely be withheld from the Phillies' first handful of Grapefruit League contests until his visa issues are resolved.